A footballer has been jailed for hitting a rival player in the face during an FA Cup match. Barrow defender James Cotterill, 24, pleaded guilty to punching Bristol Rovers striker Sean Rigg during a first round match on 11 November last year. He was sentenced to four months at Preston Crown Court after admitting grievous bodily harm. Cotterill is thought to be the first player in recent history in England to be jailed for an offence on the pitch. 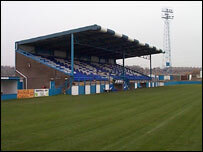 The incident took place at Conference North club Barrow's Holker Street Stadium. Father-of-one Cotterill fractured Mr Rigg's jaw in two places during the "highly charged" match between Barrow and their League Two opponents. The court heard Mr Rigg had to drink through a straw and eat with a teaspoon as a result of the punch. His jaw will be held in place by metal plates for the rest of his life. Peter Kennedy, defending, described the punch as "a moment of folly" that took place in "the heat of the moment". Cotterill hit Mr Rigg from behind so the striker had no idea what had happened to him. He told police that, earlier on in the game, Mr Rigg had "barged into him". 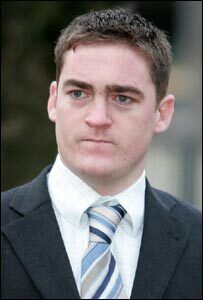 Mr Kennedy said: "The defendant thought this was about to recur so he said he struck out and punched him to get him away." The off-the-ball assault was not seen by the referee or any other players, however television cameras captured the off-the-ball assault, which was shown that evening to millions of viewers on the BBC's Match of the Day. The Football Association (FA) banned Cotterill from playing football until March 2007. Cotterill resigned after the incident and has been working as an apprentice cable jointer while he sees out his suspension. He was ordered to pay £270 costs.